The United States Patent and Trademark Office (USPTO) has granted Apple a new patent that indicates the tech giant may be developing a new camera for the iPhone and iPad that uses three sensors, each with their own lens. The US patent No. 8,497,897 is for "Image capture using luminance and chrominance sensors" on mobile devices. 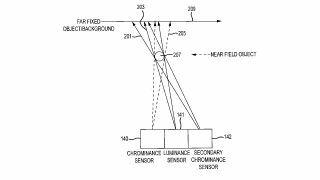 The system would use two chrominance sensors and one luminous sensor with a lens sitting in front, allowing the capture of three separate images that collect colour, light and other data. The raw data can then be combined to create a higher quality composite image, which would be particularly handy for taking photos where light is not readily available. Though we probably won't be seeing the new camera tech in any upcoming iPhones this year, smartphone camera quality seems to be the new "go to" frontier for device dominance, what with Nokia claiming that its Lumia 1020 is "the first smartphone to put the camera first" and Samsung releasing the Galaxy S4 Zoom. The focus on cameras in smartphones has been around for ages, only increasing because of apps like Instagram, Snapchat and Vine, so this new patent could be a boom for Apple as it faces dropping market share. But while the USPTO granted this camera patent to Apple, it also invalidated Apple's "pinch-to-zoom" patent earlier this week, which could cause more troubles for the tech giant in its court cases against Samsung.